For the final 2011 release of their worldwide exclusive adidas Originals "Archive Collection," UK retailer Size? introduces the Malmo in a new colorway. For the final 2011 release of their worldwide exclusive adidas Originals "Archive Collection," UK retailer Size? introduces the Malmo in Green/Chalk/Gum, the third colorway of the model to release since being brought back in the original Sunshine/Blue Bird colorway back in August. 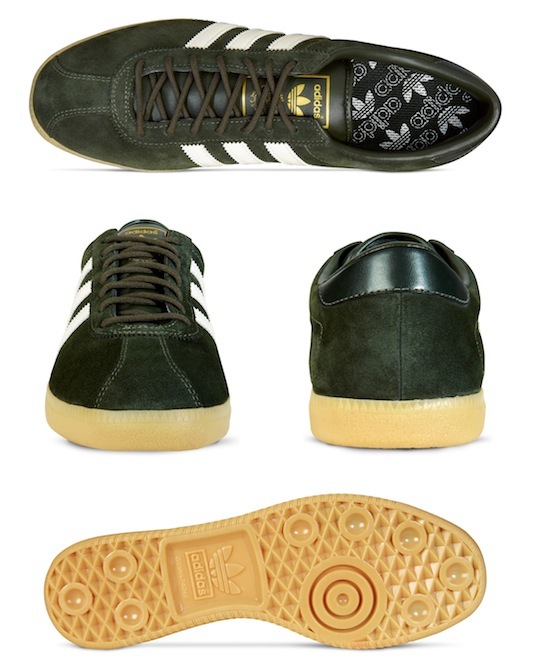 The shoe sports a dark green suede base with contrasting chalk leather 3-Stripe branding and a sturdy gum sole. This new colorway of the Malmo will be made available this Friday, December 16th at Size? stores and online.